You can restore the colors in faded photos as you copy them. Load photo paper in the product. Press the arrow buttons to select More Functions and press the OK button. Select On and press the OK button. Place up to two original photos on the product. Note: Press the up or down arrow buttons for instructions on placing your photos on the product. Press the + or – button to select one or more copies of the photo (up to 99). If you placed two originals on the scanner, press the left or right arrow button to view the second original, then press + or – button to select one or more copies of the photo (up to 99). To select settings for the photos, press the down arrow button. To change the display setting for the LCD screen, select Display Mode, press the OK button, and select the setting you want. To change the print settings, select Paper and Copy Settings, press the OK button, and select the necessary settings. 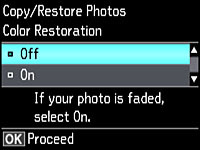 To adjust the copy image, select Photo Adjustments, press the OK button, and select the necessary settings. To add a black-and-white filter, select Filter, press the OK button, and select B&W. To crop or zoom into your photo, select Crop/Zoom, press the OK button, and press the + or – and arrow buttons to adjust the image area. Note: To cancel copying, press the cancel button.